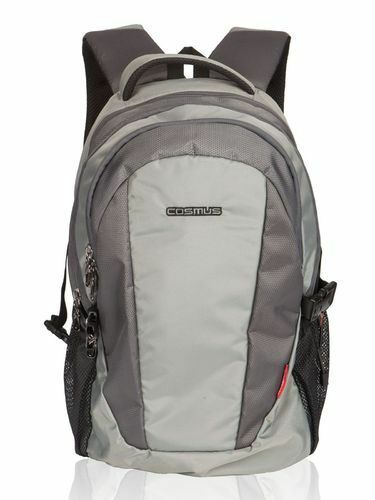 Cosmus Forbes 17 inches Laptop Backpack is ideal bag for regular office goers to carry Laptop and other daily stuff to office. Its well padded shoulder strap & ergonomics back padding ease the burden of a full bag, plus they provide lumbar support. Â It has 3 compartments, which includes one detailed organizer compartment having Â inside zipper pocket & many organizer sections. Laptop compartment is well cushioned to protect your laptop, other main big zipper compartment to carry your books, files/folders and other essentials items & 2 mesh side pockets to carry water bottle and other easy access items. Bottle Lock attached to one of the side pocket protects your bottle from falling down in crowded places and while on riding bike. Outer Fabric: Durable HD coated 100% Polyster water resistance Fabric. Since the inception in 1999, Cosmus Bags Private Limited has been at the forefront of manufacturing and wholesaling best in class Bags, Luggages & Leather Wallet. Our product portfolio of an exquisitely designed finest quality of chair includes Men's Sling Bag, Genuine Leather Wallet and Office Messenger Laptop Bag. We have gained the leadership position due to the groundbreaking quality of every product. Our inventory of high-grade raw material is procured from established vendors, which results in strong and long lasting performance of the product. Further, all our products are crafted with finesse and available at a competitive price. Our core strength lies in our customer oriented outlook while capturing synergies in our innovative technological approach and manufacturing expertise. We are committed to good manufacturing governance and are highly accountable to fabricate every product with superior levels of transparency and integrity. All our product offerings strengthen our position in the market, as we develop each article with a successful endeavor to improve the lives of our end-consumers. We analyze their needs, we use advanced technology and we become unbeaten in finding new possibilities for comfort and worth.